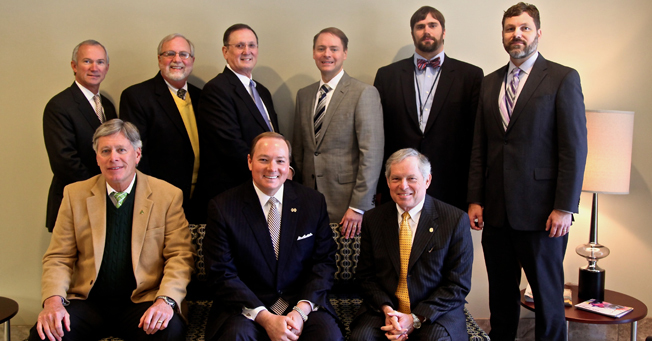 (From left, back): John Lundy, Pat Taylor, Peter Jernberg, Cliff Kling, Matt Morgan, Steve McCartney; (front): Bill LaForge, Mark Keenum, and Lee Royce. College presidents from three Mississippi institutions spoke to faculty and staff yesterday about higher education as part of Jackson Academy’s Professional Development Day. Bill LaForge of Delta State University, Lee Royce of Mississippi College, and Mark Keenum of Mississippi State University addressed the future of higher education and ideas for preparing students for college success. All three presidents complimented JA on how incredibly well prepared for success our students are who enter their institutions. They also commended the school on the progressive teaching and learning that takes place at JA. 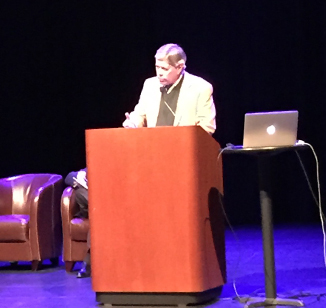 President LaForge discussed the redefining and rethinking that is underway in higher education, online versus traditional delivery, practical aspects of helping students discover their path, and the cost of higher education. He noted that there is great demand for online education, as well as interest in student-centered and hands-on learning. Higher education is challenged to address online education effectively, in a way that is not a detriment to students. He mentioned the importance of time spent by faculty and students face-to-face. 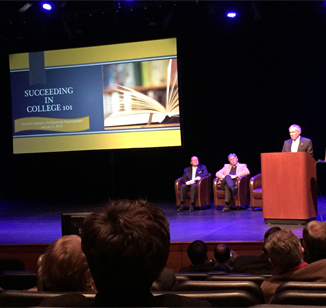 President Royce presented a snapshot of what it takes to succeed in college. He noted that students are entering college with many challenges that in some cases prevent them from completing a college education. These may be financial, medical, emotional, or other concerns. He also noted that many students are not prepared in the fundamentals needed to succeed. To help students complete college degrees, Dr. Royce urged faculty to do three things: teach fundamental academic skills, teach fundamental study skills, and stress positive social and behavioral skills. Teach Fundamental Academic Skills: Writing and reading proficiency and computational proficiency. Teach Fundamental Study Skills: Attendance, preparation, a unified calendar of assignments. Stress Positive Social and Behavioral Skills: Maintain a reasonable sleep schedule (keep your days, days, and nights, nights); be involved on campus, but avoid over involvement; choose friends and activities that are positive and uplifting; avoid alcohol, drugs, gambling, and other risky behaviors as well as the places that promote them. 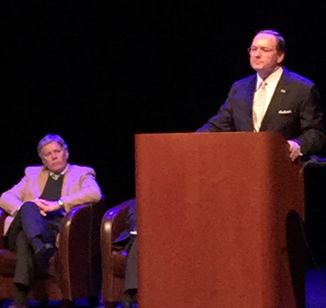 President Keenum discussed societal changes that all—students, educators, and their families—are experiencing today. These included instant connectivity and the power of technology, careers projected for the future that do not exist today, and the wealth of information available through the Internet. He recommended several ways to prepare students for a life where uncertainty is the norm. Help students understand how to solve problems and make a decision. He stated that the students from JA are well prepared as writers, but he would encourage them to do even more to build communication skills. Writing is essential for career success, and verbal presentations build confidence. Major corporations that visit MSU are looking for workers who are well educated and can work well with others. Being a good person contributes to becoming a good leader. Live your life with integrity. Be an honest person. Hard work is required for success. Treat other people the way you want to be treated, even those unlike you. Respect them as a human being. If you live your life with integrity, hard work, and respect for others, you will be successful.